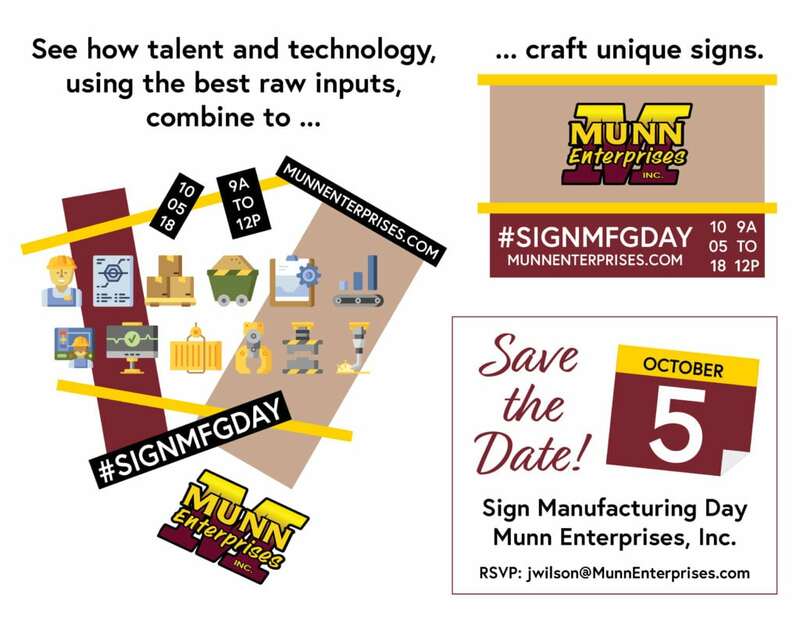 On October 5, 2018, we will host Sign Manufacturing Day at our facility. Sponsored by the International Sign Association, #SignMFGDay highlights the exciting and diverse sign manufacturing industry. 9 a.m. – The day will begin with light refreshments, a warm welcome from the Munn family and company leaders, and the showing of a 6-minute video about Munn Enterprises. 9:30 to 10:30 a.m. – Our 70,000-square-foot plant will be open for tours and departmental personnel will discuss their role in the process. 10:30 a.m. – There will be an open Q&A session about our industry. 11 a.m. – Lunch will be served and guests will mingle with our team. *** Because of the nature of our work, safety glasses and other protective equipment will be furnished and are required while touring the plant floor and outer buildings. Explore career opportunities within the industry! Link the classroom to the real world by seeing how careers in welding, design, precision machining, CAD, and so many others are put to use in our vibrant industry. Speak with industry veterans and learn about the pros of manufacturing jobs. Get a first-hand look at the various processes involved with sign manufacturing. Take pride in the value of manufacturing to our local economy! We are happy to invite you to participate in the day’s activities, which will begin at 9 a.m. and conclude around noon. Lunch will be provided, as will Q&A opportunities, a plant and office tour, and equipment demonstrations. Download the event flyer in PDF format here. Register for the event using the form below. If you have questions or need additional information, please contact Joshua Wilson, Art and Marketing Manager, at jwilson@munnenterprises.com or by phone at (601) 264-7446 ext. 1008.